I was a witness to that from the beginning and after the laborer finished working and left, I and some of my fellows of young men entered the tomb uncovering the dust and looking for something that may indicate the owner at the rotten bones, then I found very long hair but it rapidly decomposed so I thought that it belonged to a woman and then we kept working till we found on a jar of pottery collapsed in our fingers as soon as we lifted it up , the jar was filled with dust and nothing remained from it except the dust , afterwards we decided to stop because we did not find anything, so went outside and chatted about the graves and the buried treasures, the night of that day was cloudy and my mother was visiting the my aunt’s house and asked me to accompany her to go back with her to our house at 9:30pm. The way to the my aunt's house requires passing before those neighbors' house who found the tomb, at that age I was not fear the dark so I passed in front of the hole which was still open and I said to myself that the neighbors should leave even a warning sign to the pedestrians at night preventing anyone of them to fall in the hole , having exceeded the hole about ten meters, I heard a chat voice, then I said to myself whether it was reasonable that I passed before a neighbor standing next door to his house and I could not notice or even to greet him/her ! 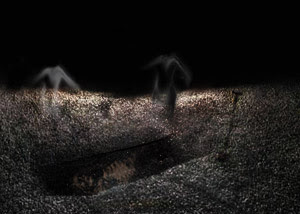 So I decided to look behind me and do the duty of greeting and apologize about what I did of unintended ignorance, then I saw unbelievable thing, as I saw two persons standing over the tomb’s hole, though they were not lean on anything like they were attached in the air, and their tallness was more than two meters each, and each one was face to face to the other , the first one was of light as if you put a white lamp in a white dress though his/her light did not exceed even a centimeter beyond his/her figure limits because he/she did not light the location and his/her light did not cover on the blackness of the other person who was standing before him/her , which was black in black, that he/she was obvious despite the night darkness, the first one was looking towards the east and the second towards the west and they were talking but I did not understand anything from their dialogue even more strange that they did not have visible heads, so I felt panic in my heart and for the first glance I did not grasp the matter, then I looked behind me and continued walking for more two steps, then the sound ceased so I re-looked behind but there was nothing, then I continued in my way thinking that I was not imagining and there was no doubt that what I saw was real. I started wondering about those two things and why they were over the tomb's hole!, I rushed with rapid run till I reached my aunt's house very exhausted , then my mother asked me: "What's wrong with you?" , so I said to her: "Fear and terror and fatigue got me", Since then I became fearing the tombs and visiting it at night or even pass baside despite the years passing , and that image of two persons are still in my mind. The story mentioned above was published and classified as real story according to who narrated them without bearing any responsibility for the truthfulness or accuracy of its events. I gess that 2 thing are (al qareen)to the dead man .. an angel (the white one)& devil (the black one)..
this is my opinion!! and it is able to discuss! !